Credit card issuers are getting more and more proactive in dealing with credit card holders these days. They want to protect themselves against default by increasing APRs on credit cards for some card members, then closing inactive cards without any warning. Now they will just give you cash to close your accounts, whether they are inactive or are still being used. 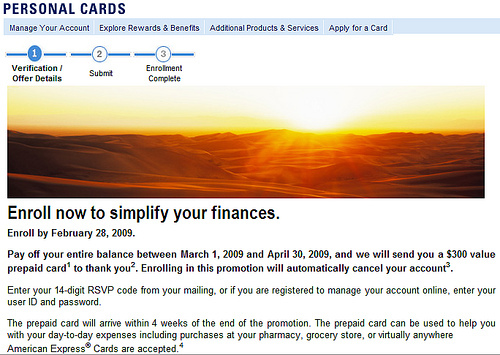 I heard it happened to credit lines such as HELOC before, but this’s the first time I heard a credit card company, American Express to be exact, is doing it. The money will come in as a prepaid card with $300 in value in 4 weeks after the promotion period ends and the money will be reported as income. To take this offer, all you need to do is go to this site from AMEX and enroll (if you manage your AMEX cards online, you can use your login to enroll). If the card you want to get rid of is either a Blue Card or Optima Card that carries rewards points, you will have to redeem the points first before canceling the cards; otherwise the points you earned will be forfeited. A good deal? Card companies used to give us bonus money to open an account. Now they are paying even more to close it. How awesome! *Thanks @JoelComm for the tip. We’re sorry. This account is not eligible for this promotion. We’re sorry. Either the code you have entered is incorrect or your Card number is not eligible for this promotion. If you received an invitation for this promotion, please verify and re-enter the unique 14-digit RSVP code found inside the mailing or email. If you are registered to manage your account online and attempted to enroll, please verify your user ID and password and try again. If you believe that you received this message in error, please call the number on the back of your Card and speak to a customer service representative regarding this promotion. We apologize for the inconvenience. @amex user Sorry for the confusion. It seems that the offer is not available for every card member. Only a small group of members received the letter with a RSVP code which is required to enroll.